Wren’s family owns a quirky catering hall. After saving Grayson’s life the two share a moment and Grayson then peruses Wren. But from the outset problems plague their relationship and they have to decide if this connection is worth saving, or if they should go their separate ways. The novel is written in dual point of view, which is quickly becoming one of my favorite points of view in YA contemporary. It gives the reader the chance to connect with both parties. I don’t think I would have liked Grayson, at all, if half of the story hadn’t been from his perspective. Wren is the average, quiet girl at her all-girls catholic school. The youngest of three, her parents describe her as the easy child. Connecting with quiet characters is always a little hard for me. I have never been quiet. If Wren’s parent-teacher conferences went like this “Your child is bright, but quiet” mine went like this, “Your child will not shut up! She’s bright but it’s overshadowed by all the damn talking she does.” It is a testament to Constantine’s writing that she was able to make me relate to Wren. Grayson is completely different from Wren. Outgoing, lacrosse star, criminal. I actually liked him more then Wren. His problems seemed more real and immediate. I was never sure if his old buddies were going to rat on him, or if he was going to be able to get his life together enough to deserve Wren. One of the highlights of this story was Wren’s two best friends Madison and Jazz. I liked how completely different they were from each other and from Wren. It was nice that they were always there to support her. I am looking forward to wild, exciting, Madison getting her own story. My biggest complaint about this novel is that a lot of the problems in the plot were never resolved. Grayson has a difficult relationship with his mother and her new family, that isn’t really resolved. Wren has a kind of feud going on with Ava and that isn’t really resolved, and one character’s pregnancy is never really handled either. I guess in life things aren’t resolved in nice little packages but, to me, if felt like a lot of things were just left hanging at the end. There is a companion story from the point of view of Wren’s friend Madison though so maybe that will tackle some unresolved questions, especially those regarding Ava. 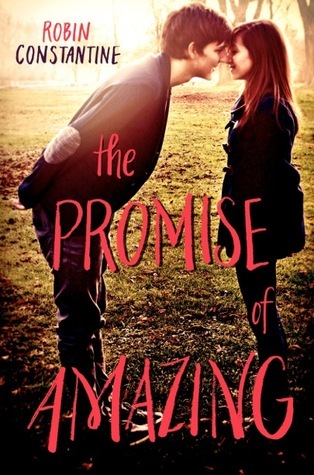 The Promise of Amazing straddled the line between YA issue lit and fluffy YA contemporary and I really enjoyed that dichotomy. I am looking forward to reading Madison’s story and seeing how Constantine tackles her sophomore novel. This is looks great! And perfect for my list of contemporaries to branch out and read! Happy Reading Emily! Oh my goodness! I had no idea that there was a companion novel. That might help to resolve some of the open endness of this book. I'm glad to see another positive review! So many people are really down on this book, and it made me sad because I enjoyed it. I do wish we'd seen more of Grayson's family. I loved his younger siblings and the depth his relationship with them gave him. I melt for boys who are cute with younger sibs. Great review, Emily!